Manchester United: De Gea; Smalling, Jones, Blackett; Lingard, Fletcher, Herrera, Young; Mata; Rooney, Hernandez. Subs: Amos, James, M Keane, Fellaini, Kagawa, Nani, Januzaj. The first 45 minutes under Louis van Gaal in the Premier League were average, at best. Notably, with nine first team regulars out of contention for the match, van Gaal’s shuffling of the starting XI, Manchester United were naturally going to look a bit shaky. As the Old Trafford crowd burst into the United chant, the campaign was underway. With the manager instilling in his squad, “do what we’ve agreed upon and we will win,” it was United who came out of the blocks on the upper hand. But the first half was far too comfortable. Jesse Lingard, Ander Herrera and Tyler Blackett all received their debuts in the Premier League and impressed early on following successful pre-seasons. As the wing-backs remained on the touchline, Swansea City was pinned back in their half on numerous occasions in the first quarter of an hour, but to no avail. Yet the positive play from the feet of Lingard would not even last a half hour. After promising play to begin the half, Lingard then went into a crunching tackle with Swansea’s Ashley Williams who is nearly twice his size in the 18th minute, forcing the youngster to make way for Adnan Januzaj. And when Januzaj came into the fold, the reds seemed to spring to life yet again. A few key sequences between Phil Jones and Juan Mata worked up the right hand-side of the pitch with absolute ease, subsequently forcing a save out of Fabianski – a save that would prove vital in the coming minutes for the Swans. Following all of the pressure from Manchester United, Swansea went ahead after 27 minutes following a left-footed curler from just outside the penalty area, past the outstretched hands of David de Gea. Ki Sung-Yeung lost his defender in Mata in the midfield far too easily, allowing Swansea to easily maneuver atop the penalty area. 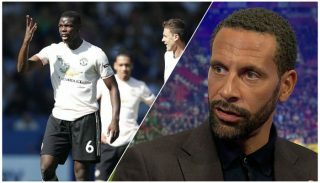 The Spaniard was guilty of trying to close the ball down, nearly on top of vice-captain Darren Fletcher allowing for the entire left-side of the pitch to open up yards of space. With the new system of three defenders, it appears quite readily the squad are continuing to unlock the formations utmost potential. What it would be like to be a fly on the wall at half-time. 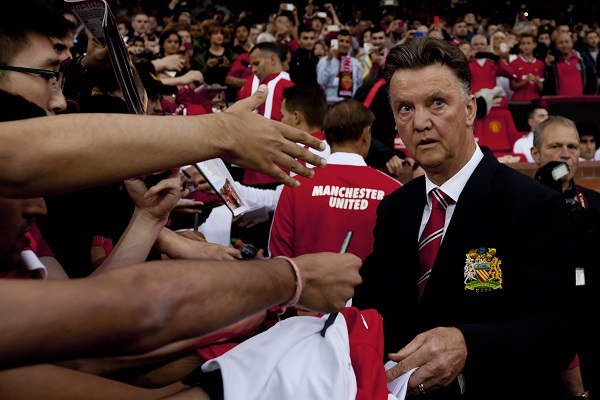 Imagine van Gaal plotting a team talk, tactical changes and a motivation speech to rediscover the United of old. The second half began with the exit of Javier Hernandez for Nani, placing Rooney in a far more advanced role. But the main factor happened to be Januzaj absolutely toying with Neil Taylor. It was the young Belgian who beat Taylor once again, allotting for Mata’s ensuing corner kick. With the Spaniards inswinging corner, Jones who made a brilliant run got a small flick on the ball before it was the skipper Wayne Rooney whose acrobatic overhead finish put United level after 53 minutes. From there forward, it was all United. The shackles were off. The free-flowing football was upon the reds of Manchester. Rooney took a free-kick from nearly 25 yards out with about a half hour to go in the match, but his perfectly placed curler went off the outside of the right post. The second half continued to be all United. The Stretford End was urging the reds forward, until the traveling supporters were rewarded. After a quickly taken free kick for Swansea, United could not clear the danger in the penalty area after Sigurdsson pounced on the dribbler past de Gea. And the frustration around Old Trafford poured. Whilst it was the jeers of yesteryear, United could not salvage a point.